Angel, a.k.a. 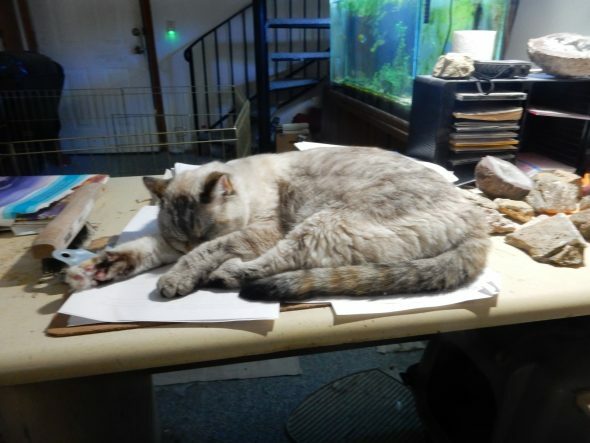 Ming the Merciless, has gotten in the habit of curling up on my side desk while I’m working at the computer in my man-cave. Every day seems to be a vacation for her. My last day of work was Thursday. 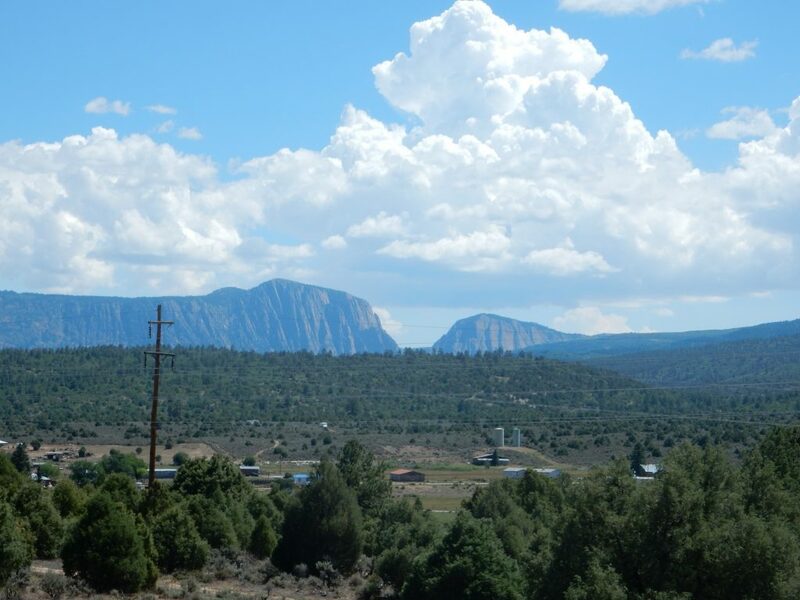 I’ll be heading off shortly for Utah for the family reunion, followed by a geology tour of western Colorado, where I will hopefully rendezvouz with Bruce Rabe to share the adventures. Meanwhile, I did some preparation Friday and spent Saturday in the Chama area with Gary Stradling. I’ve got plenty of pictures of the first part of the drive, which is old familiar ground. North of the turn to Abiquiu Reservoir is ground I’ve not covered nearly as well, However, I was so engrossed in the conversation with Gary that I did not think to take pictures until we reached Navajo Canyon, where we stopped to stretch our legs and admire the road cuts in the Morrison Formation. 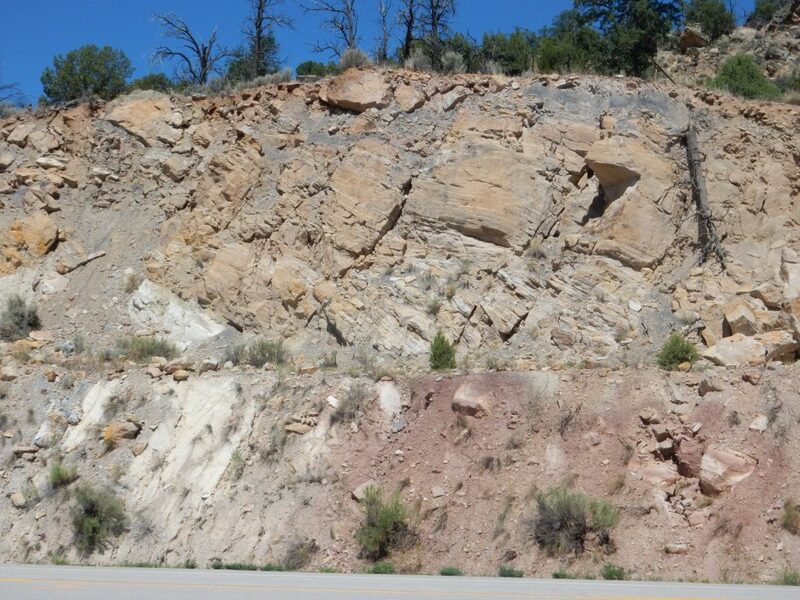 The Morrison Formation is famous for its dinosaur beds and its colorful mudstones. It dates back to around 150 million years ago, in the late Jurassic Period, when it was laid down in river floodplains covering a vast area of North America; the formation is below the surface to the east, in the Great Plains, and has been eroded away in many areas of the West where it was brought to the surface by the rise of the Rocky Mountains. Gary finds the thin bedding here irresistible and goes seeking a yard rock. (He found a nice one.) I walk up the road to where there are some vivid green mudstones. The whole lower part of the canyon wall is mapped as Brush Basin Member of the Morrison Formation on my map. 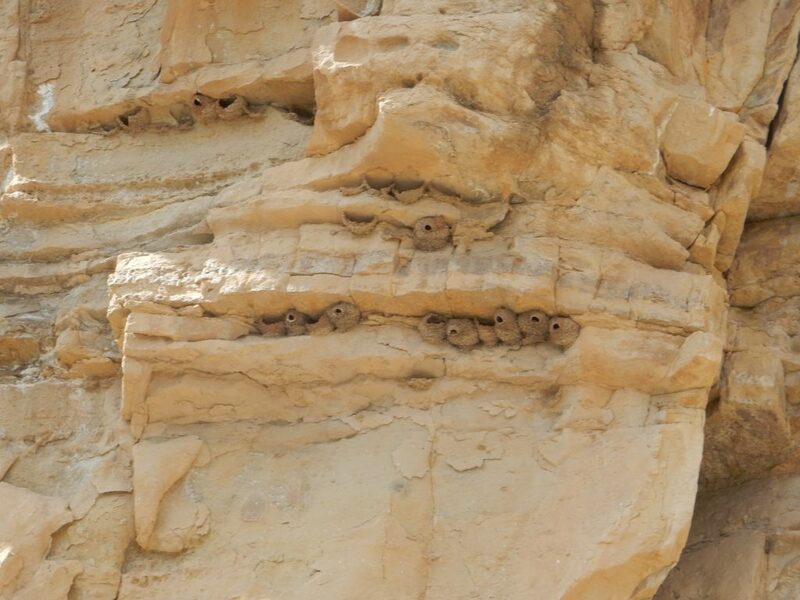 This member is mostly mudstone; the sandstone Gary is casting larcenious eyes upon is a bit unusual. The rim of the canyon in the background is Dakota Formation, another very extensive formation that is late Cretaceous in age, around 100 million years in age. It marks the beginnings of the Western Interior Seaway, where the ocean flooded central North America. The Cretaceous had the highest global sea levels in the geologic record, and central North America was low ground between the young Sierra Nevada to the west and the older Appalachians to the east. Further north, we come to a superb lookout point for much of the area we will be visiting today. 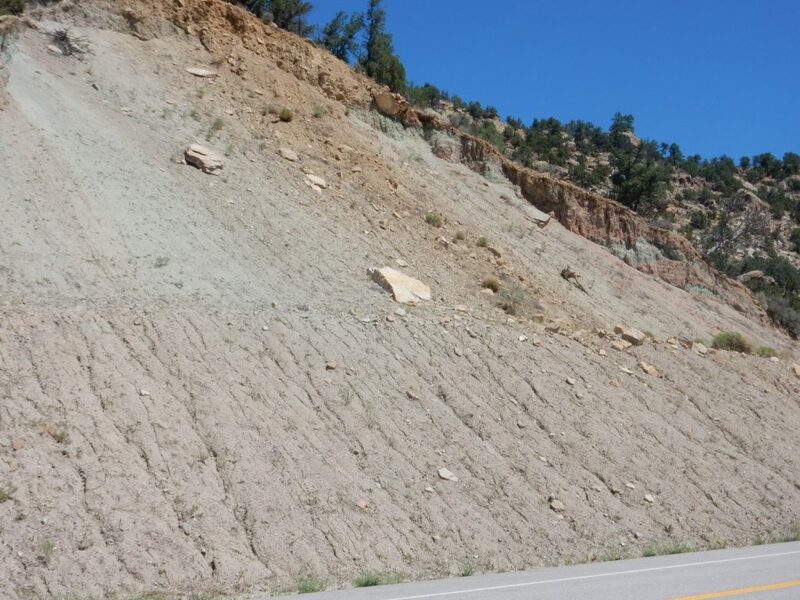 The road from which I’m taking this photograph is cut into the upper Mancos Formation, another very extensive formation from when the Western Interior Seaway was deep enough to lay down ocean mud. It is around 80 million years old. The cliffs to far left are formed by the Mesaverde Group, here consisting of the Point Lookout Standstone with patches of Menefee Formation on top. These mark a regression-transgression sequence, where the ocean briefly retreated to leave a bed of beach sand (the Point Lookout Sandstone) and then coastal swamp mud (the Menefee Formation). 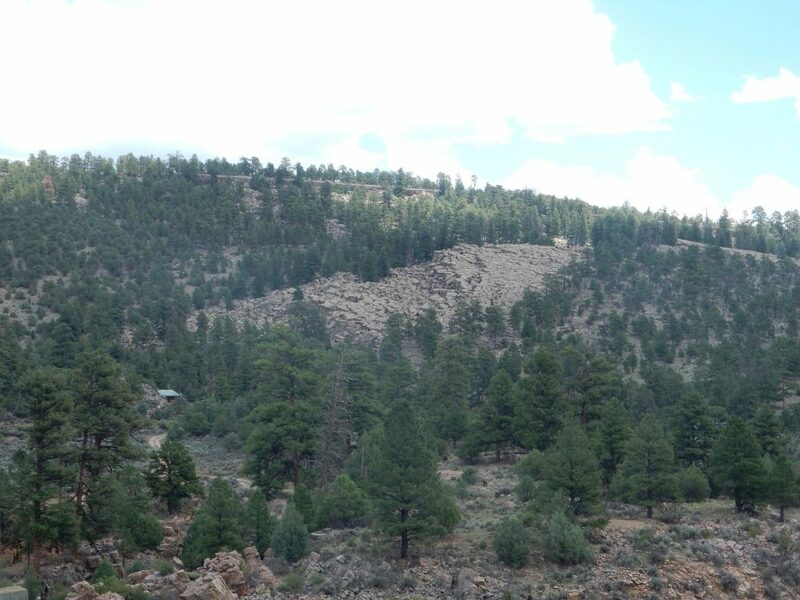 The latter contains extensive coal deposits in some parts of New Mexico, though not in this immediate area. Right of center, looking directly west, is the canyon of the Rio Chama, with Heron Reservoir just visible to its north. El Vado Reservoir is hidden behind the hills south of the Rio Chama. 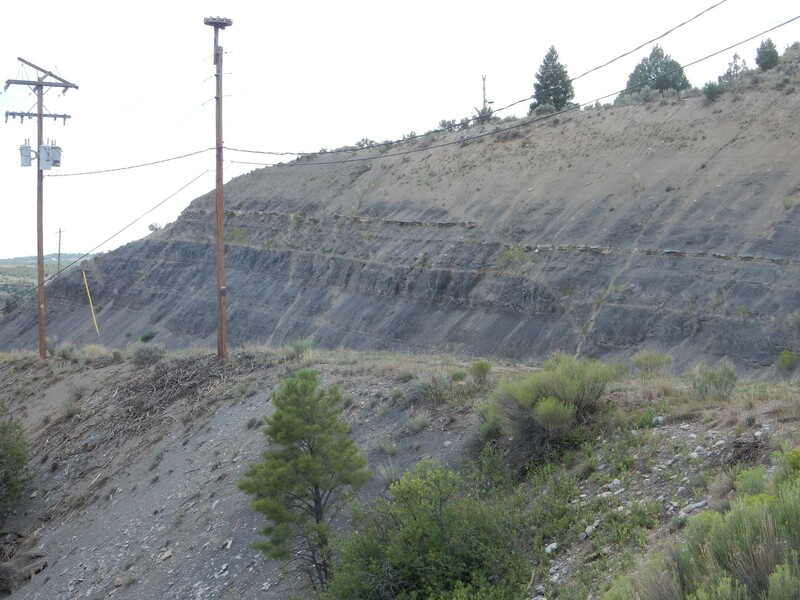 Gray and tan beds of the Mancos Shale are well exposed in the nearby hills to the right. 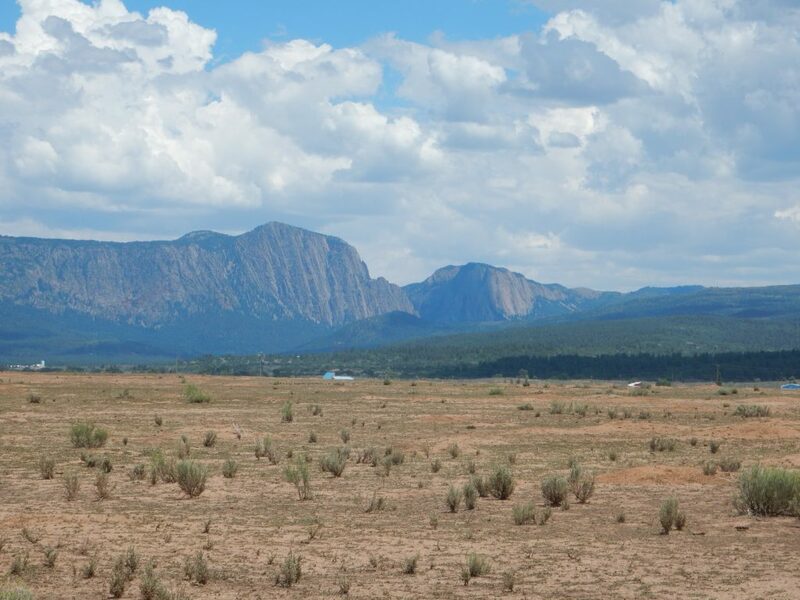 Various members of the Mancos Shale make up most of the ground in the middle distance to the west. 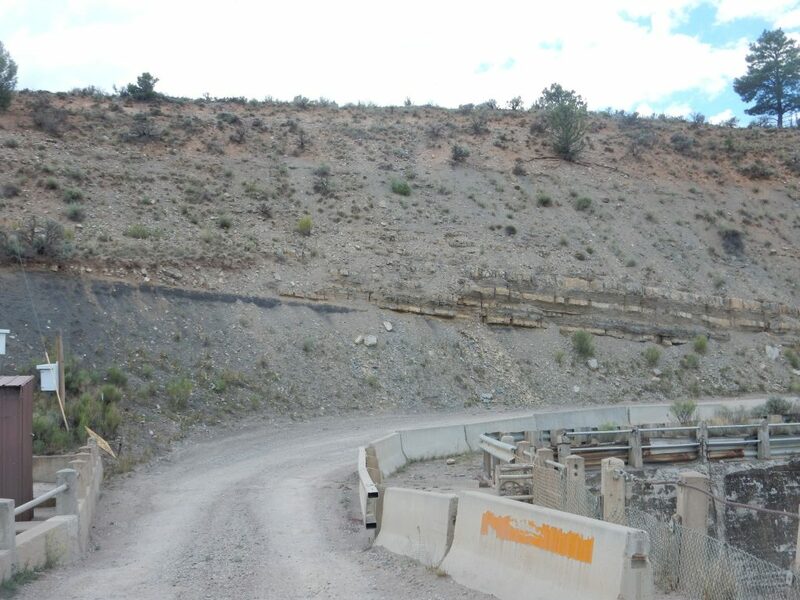 There is some automobile debris in the foreground; geologists sometimes refer to this as “Detroitus.” There is a roadside shrine to the right, honoring a victim of a traffic accident along this stretch of road — a common practice in northern New Mexico, particularly among the Hispanic population. As we approach Tierra Amarilla, the Brazos Cliffs to the east attract the camera. 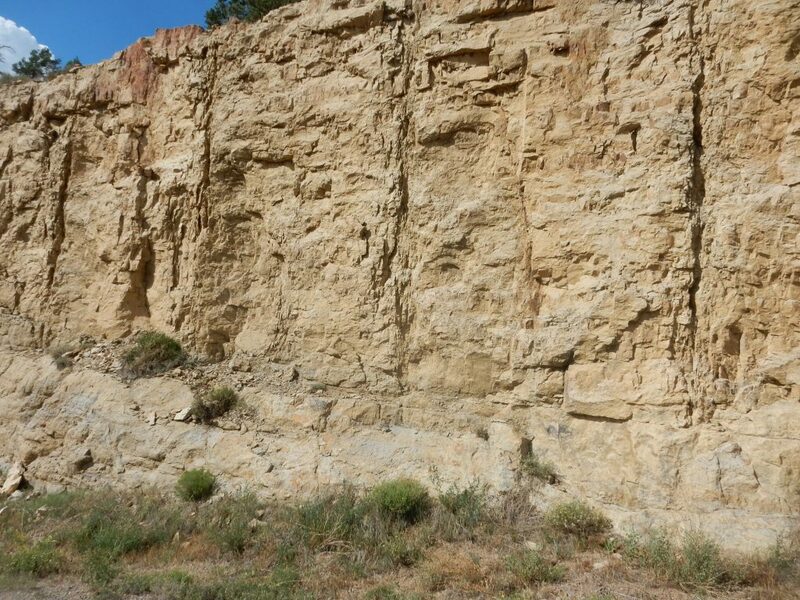 The Brazos Cliffs are incised in Precambrian quartzite that is among the oldest exposed rock in New Mexico, perhaps 1.8 billion years in age. This may be sand beds from when North America was coming together in this area, a process that seems to have taken place in fits and starts as island arcs collided with the core of the continent only to be pulled away from the continent as the next island arc approached, carried along by subducting oceanic crust. The back-arc basins formed when bits of the continent were temporarily pulled away were ideal for accumulating various kinds of sediments. There is a road to near the feet of these cliffs, and Highway 64 looks like it gives a nice view from the southeast. We may take the drive along 64 sometime for a closer look. 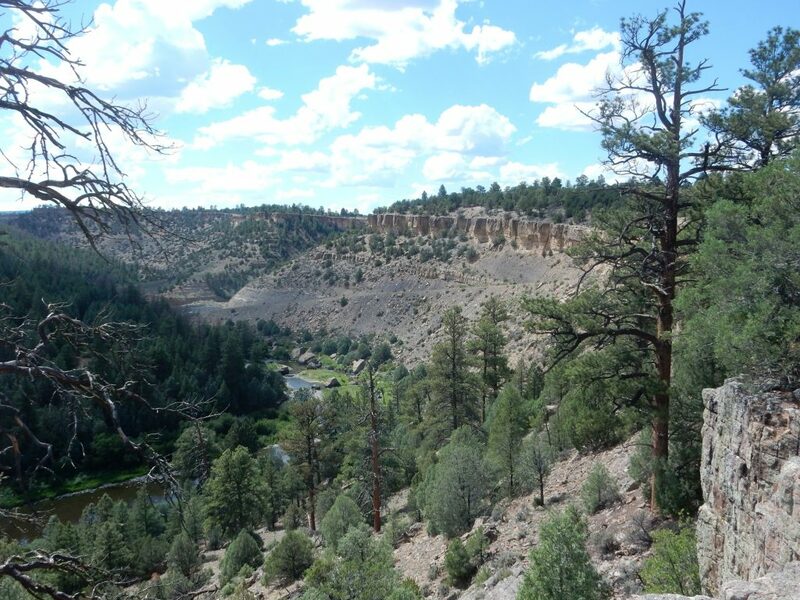 We proceed to El Vado State Park, which is near the area where Gary hopes to hunt elk in October. Part of the purpose of this expedition is to let Gary reconnoiter the area. He is skeptical that this is good elk country, but some patches may be okay, and he finds a good camping area for his base camp when the time comes. We drive on into the park, and find some beautiful wildlife already there to meet us. Osprey. Gary spotted it first but the next is very distinctive. 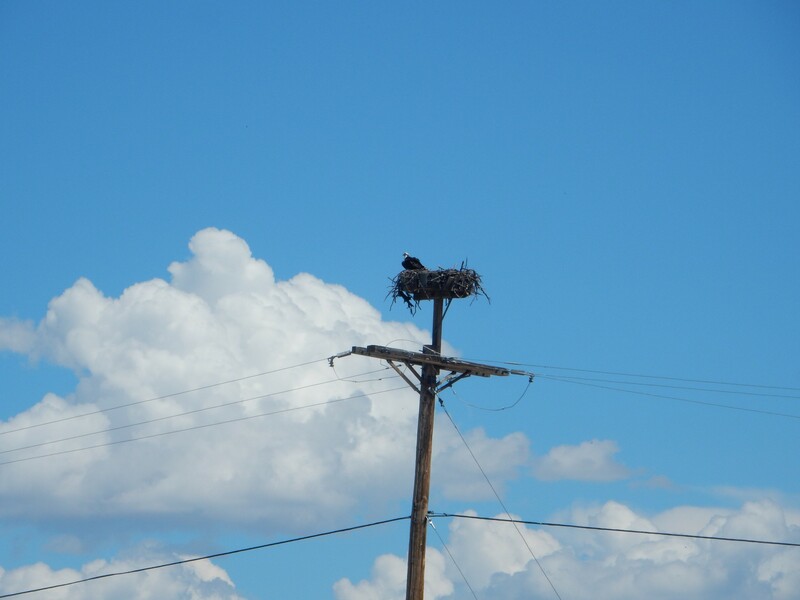 In fact, we discover that most of the line poles in this area have an osprey nest on top. I should not like to be there in a thunderstorm, but the osprey seem untroubled by the thought. We head out to Shale Point. 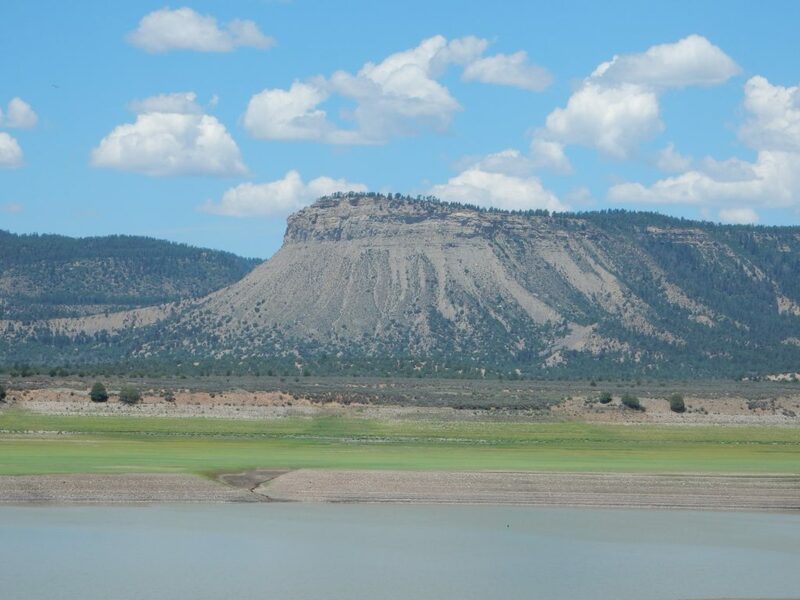 Across the reservoir to the west are Pounds Mesa (left) and Apache Mesa (right). Both are underlain by Mancos Shale capped with Mesaverde Group. The line of mesas here separates the San Juan Basin to the west from the Chama Basin in which we are standing. 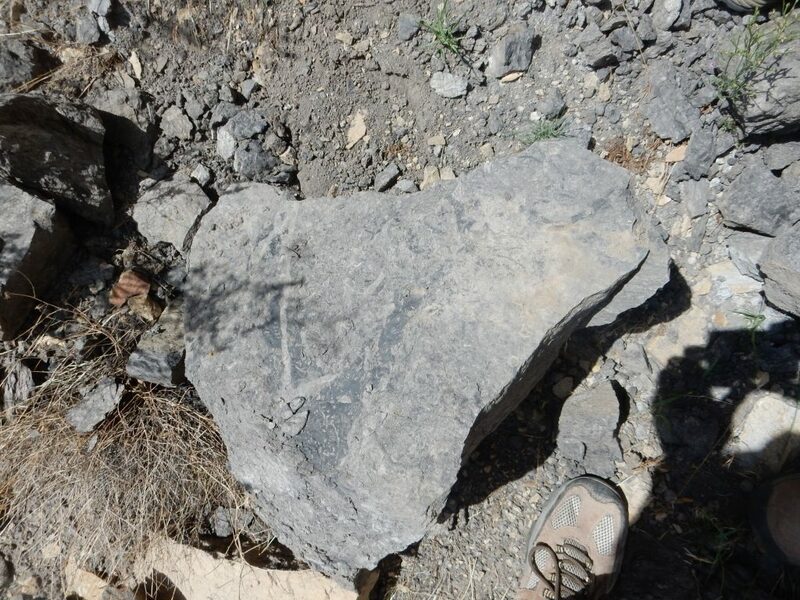 While looking for a geologic map of the mesa, I stumbled across a report that there are black sandstones atop the mesa rich in heavy metals such as titanium, zirconium, actinides, and rare earth metals. These formed as beach placer deposits, where wave action concentrated the heavy minerals. Perhaps it will be worth mining these someday. Shale Point is indeed underlain by shale. Shale is a mudstone laid down in very quiet water, where the tiny flakes of clay settle gently onto the bottom so that they lie flat. This produces the thin layering that distinguishes shale from other mudstones. 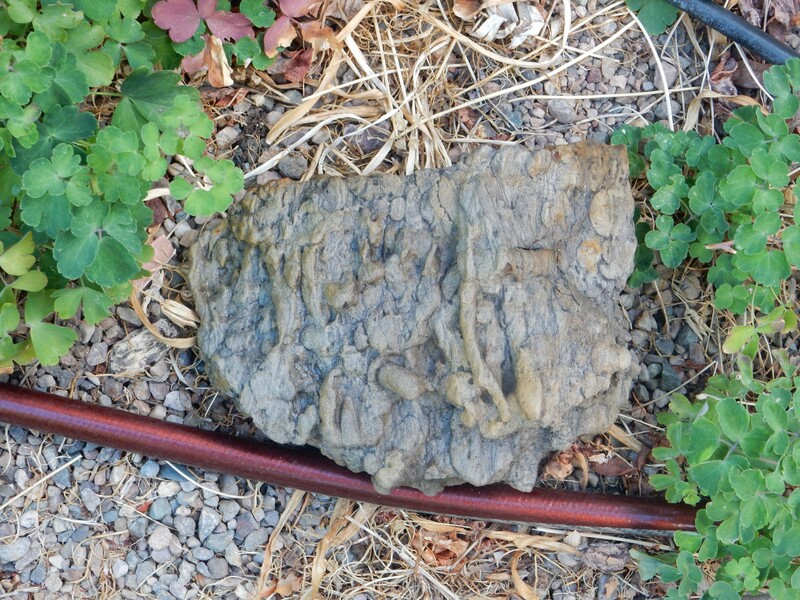 This shale belongs to the Carlisle Member of the Mancos Formation. The ranger catches up with us here, and Gary asks him about hunting. Yes, there really are elk in the area, at least during colder autumns. Gary seems relieved. We detour around to the dam itself. 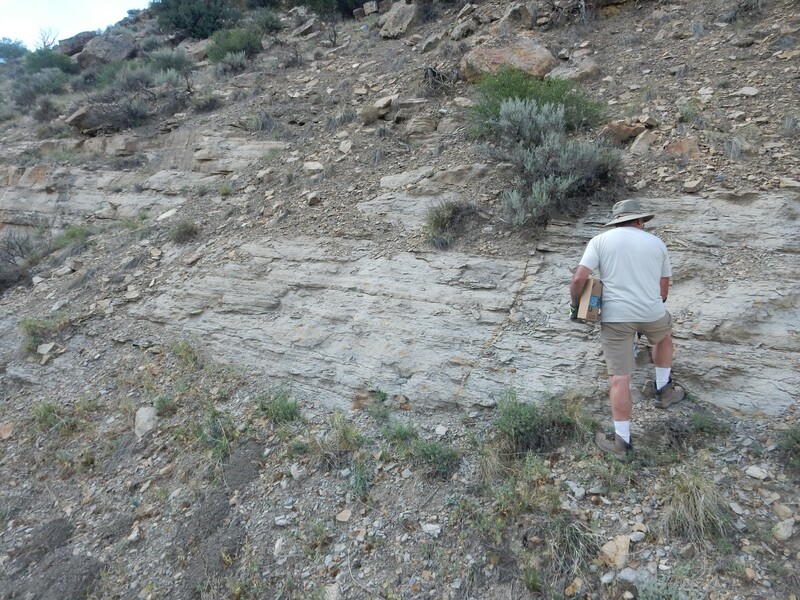 At its southwest end are wonderful exposures of the Graneros, Greenhorn, and Carlisle Members of the Mancos Formation. The lower, very dark beds are Graneros Member. 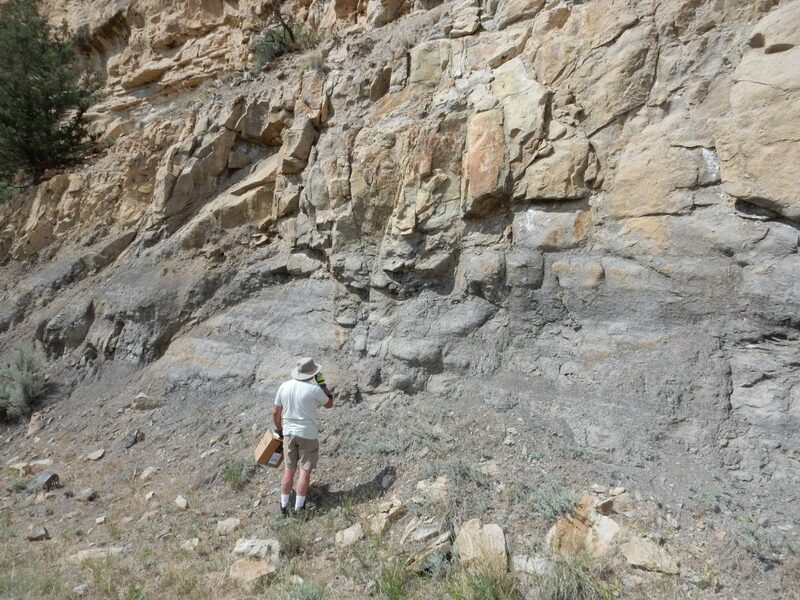 Then come limestone beds of the Greehorn Member, then more shale beds of the Carlisle Member. The lighter pinkish beds at top are relatively young river terrace gravels. 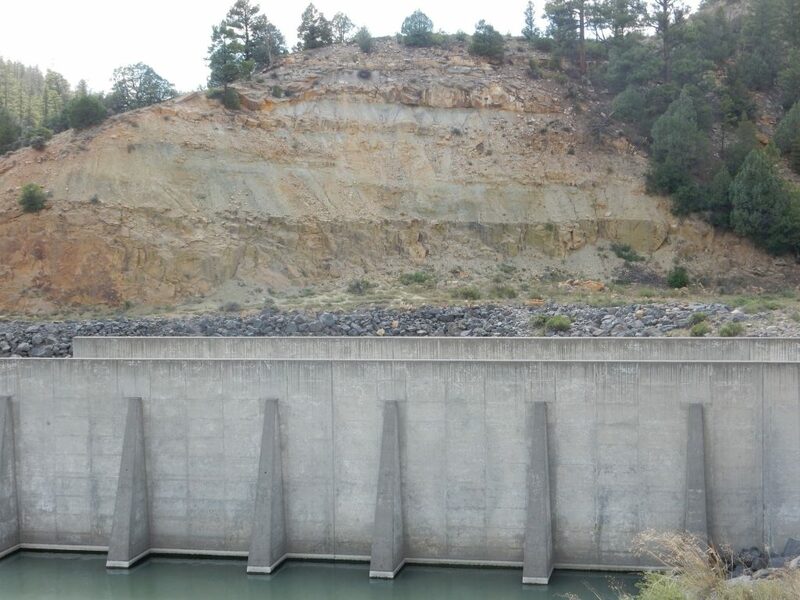 More Graneros Member south of the dam. I didn’t notice at the time, but there is an odd structure atop the telephone pole. 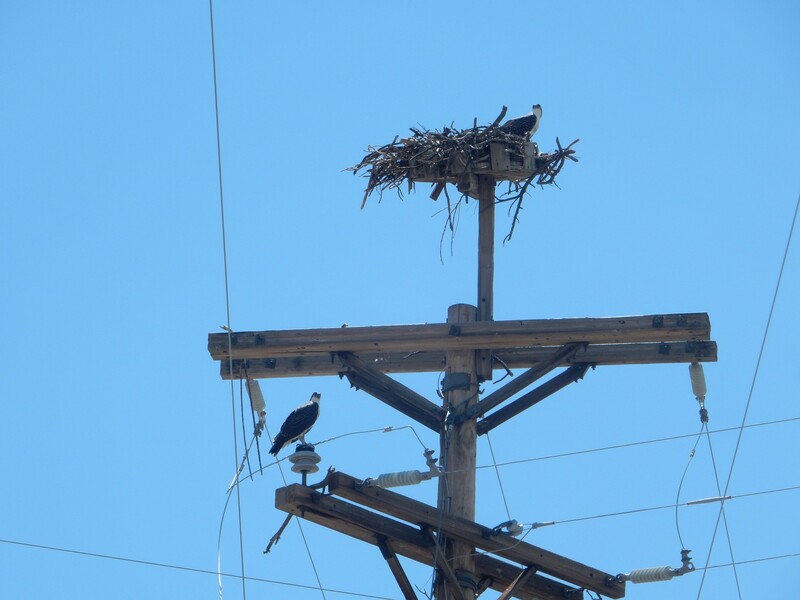 The little bulb went on, and I looked back at my previous osprey photographs. 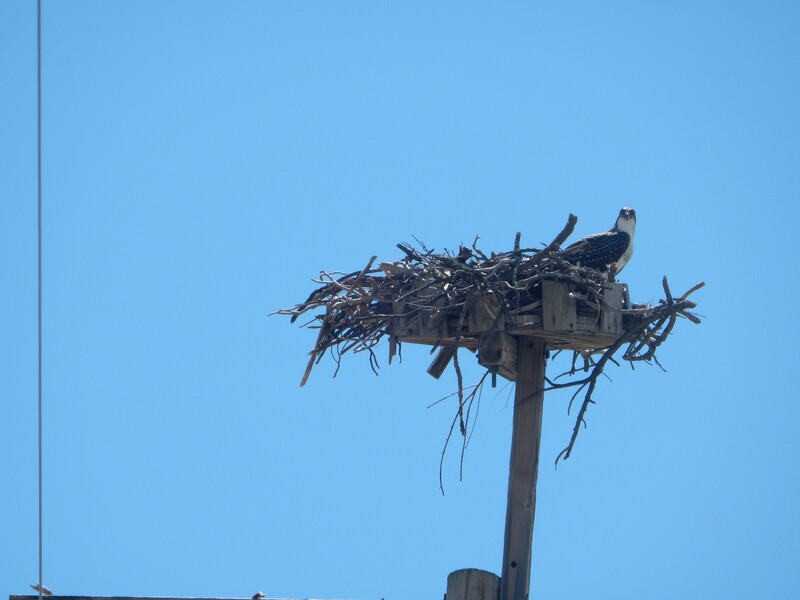 Sure enough, the structures appear to be deliberately designed to attract nesting ospreys, though this one failed. Looking back east across the dam, I spot something way cool. The geologic map simply shows Dakota Formation underlying the hill. But, looking at the jumped sandstone blocks at left, and at right halfway up the hill … that has got to be an impressive slump deposit. It looks like the entire side of the hill detached — you can see what looks like the detachment point at the crest of the hill — and slumped down the hill, lubricated by a layer of shale beneath the hard sandstone. Here’s a closer view of the slump to the right. 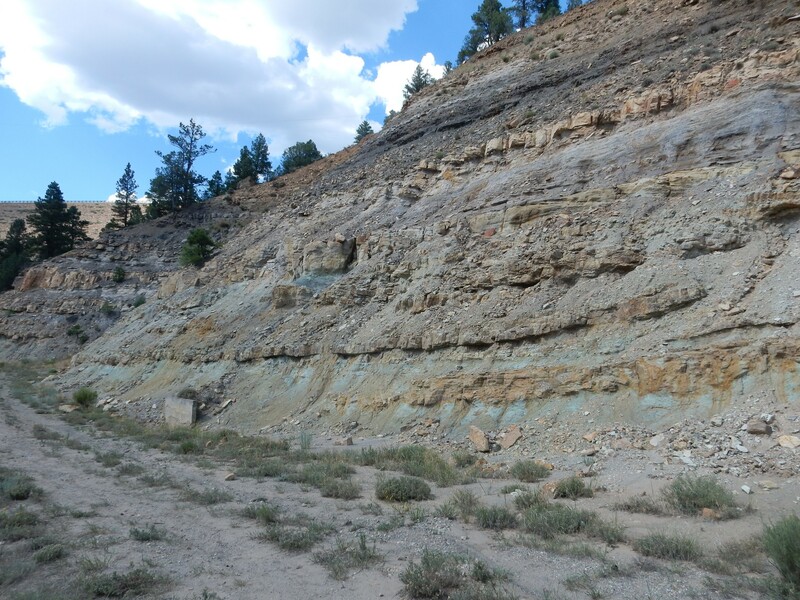 There is a very large landslide mapped further north as Dakota Formation that slumped on a base of either Clay Mesa Member of the Mancos Shale or mudstone of the Burro Canyon Formation. I’m thinking this is the same thing here. 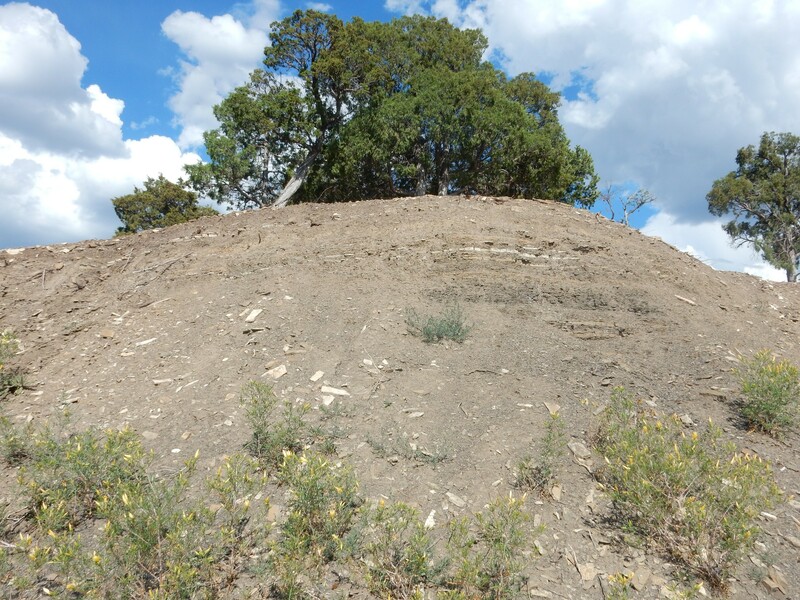 Then again … The sandstone beds at top are mapped as Cubero Member of the Dakota Formation. This is mapped clear down to the ravine below the dam. At the very bottom, the exposure is mapped as Oak Canyon Member of the Dakota Sandstone, which has some shale beds. It looks like there is some shale down there. I find myself wondering we we are look at the toe of the slump here in the ravine wall. I’m puzzling over the significance of the alternating massive limestone and thin shale, suggesting alternate periods of clear and muddy water in the Western Interior Seaway, when Gary discovers something interesting: The very top of one of the massive limestone layers appears to have a thin layer of gypsum, of all things. I’ll have to get Gary to drop some acid on it to check that it isn’t just an unusually crystalline calcite layer, but I don’t think so. 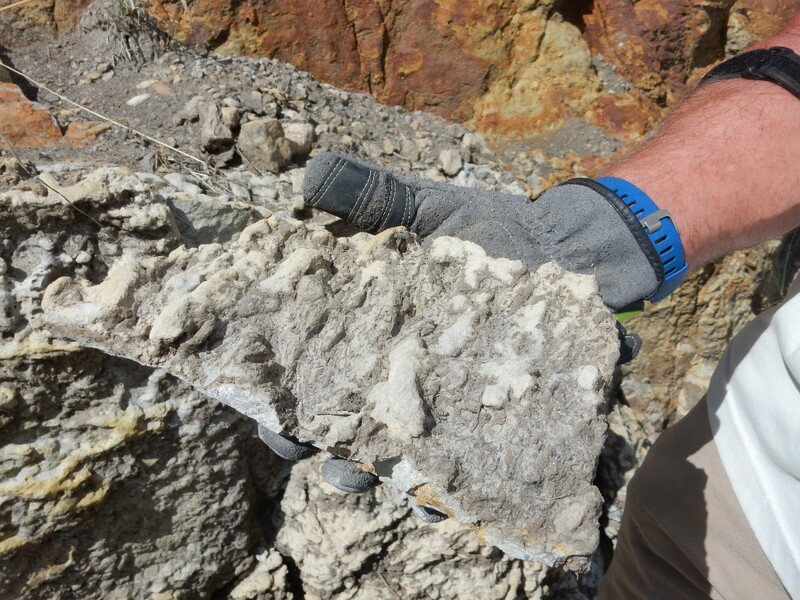 Gypsum suggests a very high rate of evaporation towards the end of the limestone cycle, just before the next load of mud got dumped in the Seaway. There are, alas, no obvious fossils. 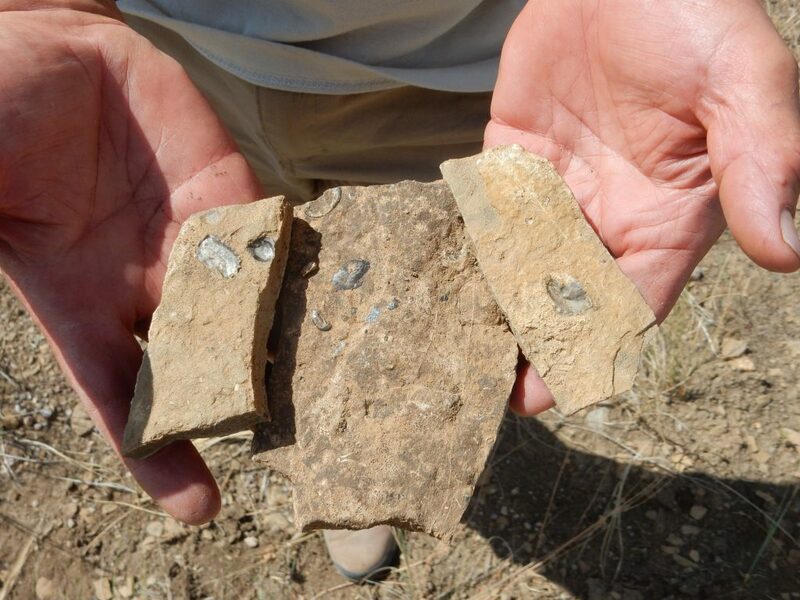 I’ve found some impressive oyster fossils in Greenhorn Member beds in central and southeastern Colorado, but none here. Driving back out (Gary is now hunting an unwary plate of enchiladas) we get another good view of the Brazos Cliffs. Deep telephoto shot, and turned out very well. This is probably my Ansel Adams moment for this trip. We proceed into Chama and find The High Country Restaurant. It’s busy and service is slow, but the meal turns out to be excellent. I had carne adovada that was not overspiced and was tender and juicy. Gary had a combination plate that he also reported as excellent. Gary, thank you for lunch. We confer. Gary is somewhat inclined to explore further north, in mountainous country that is the second wildlife area he is considering for his fall hunt. I know nothing of the geology there, but mention that there may be ammonite fossils at Heron Lake. That’s enough for Gary; we head out. 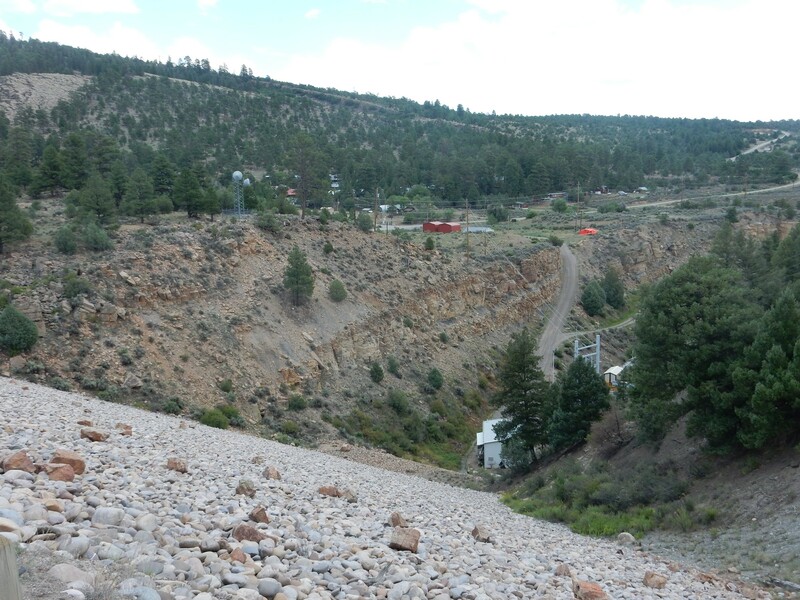 I am following a road guide that ultimately takes us to the road cut for the dam construction on the Rio Chama. But not before we detour briefly to an overlook whose trail down is closed. 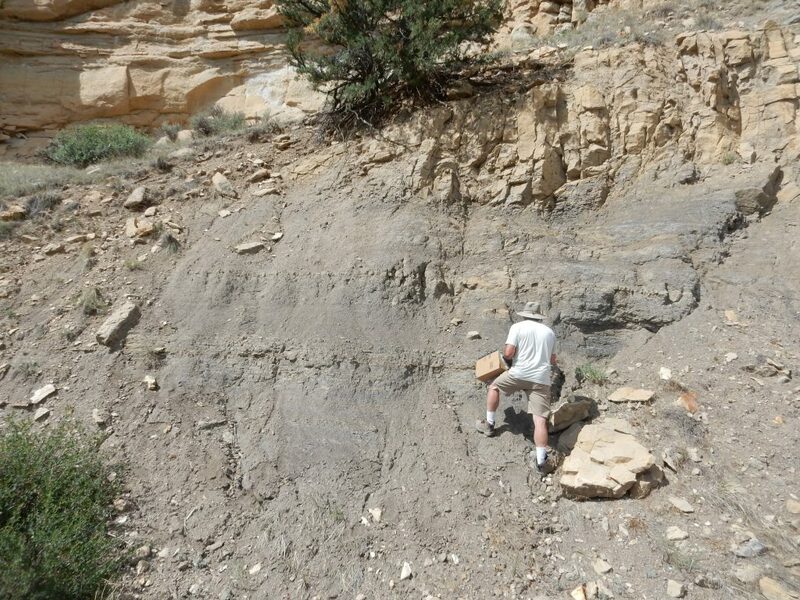 This canyon wall shows an impressive section of Cretaceous beds, which we’ll see much more of shortly — we’re going to hike down the road you see in the canyon face. 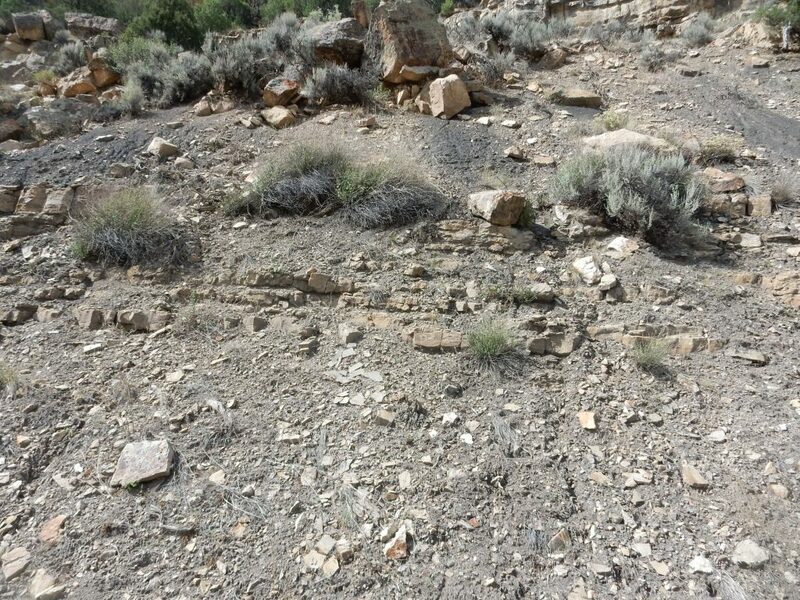 I have the mistaken idea in my head that somewhere in this section there are limestone beds with ammonites. (When I get home, I will find that the geologic report for this area mentions ammonite casts in the rocks around the lake, without any specifics — probably where I got the idea). The ledge at right is the top of the Paguate Member of the Dakota Sandstone. Above this are geologically young river terrace gravels. Admiring the thick sandstone beds of the Paguate Member. There are signs of bioturbation here. 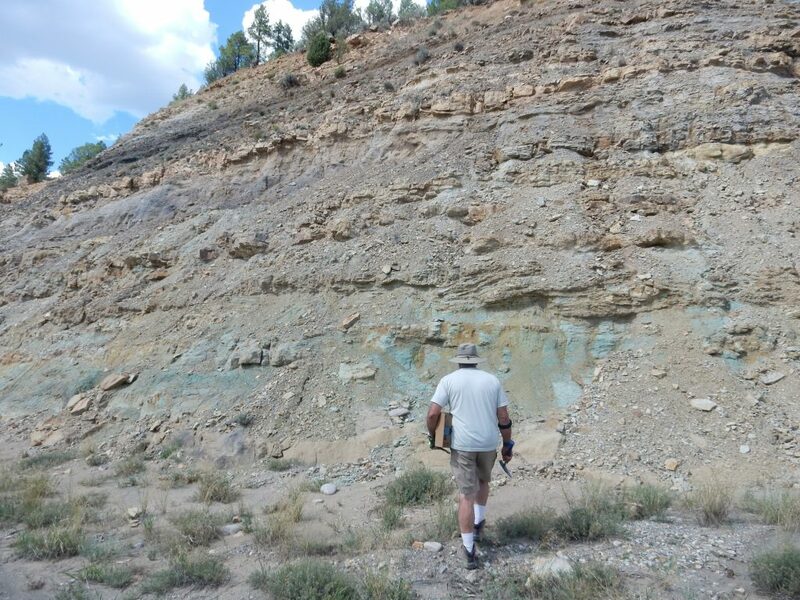 This matches the description of the Clay Mesa Member of the Mancos Shale. Whaidaminit. 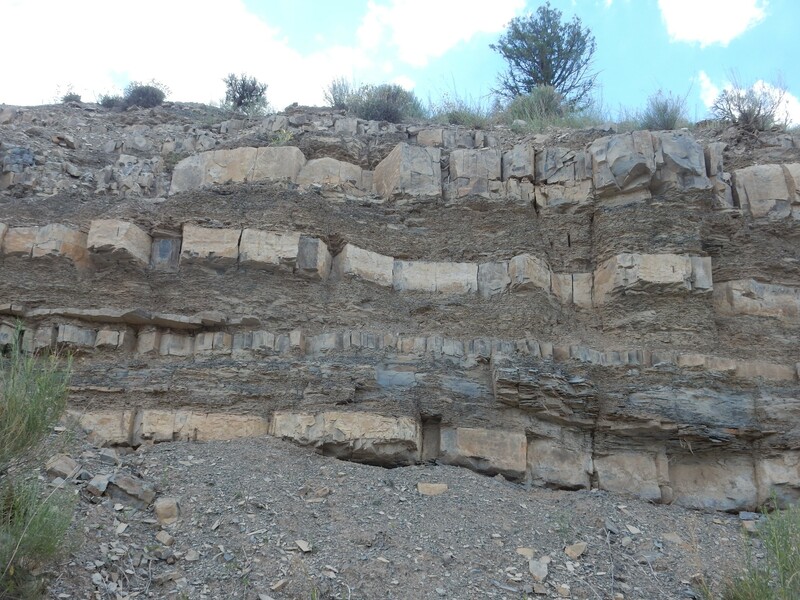 Isn’t the Mancos Shale supposed to be younger than the Dakota Sandstone? Why, yes. Yes, it is. But sometimes formations are interbedded. 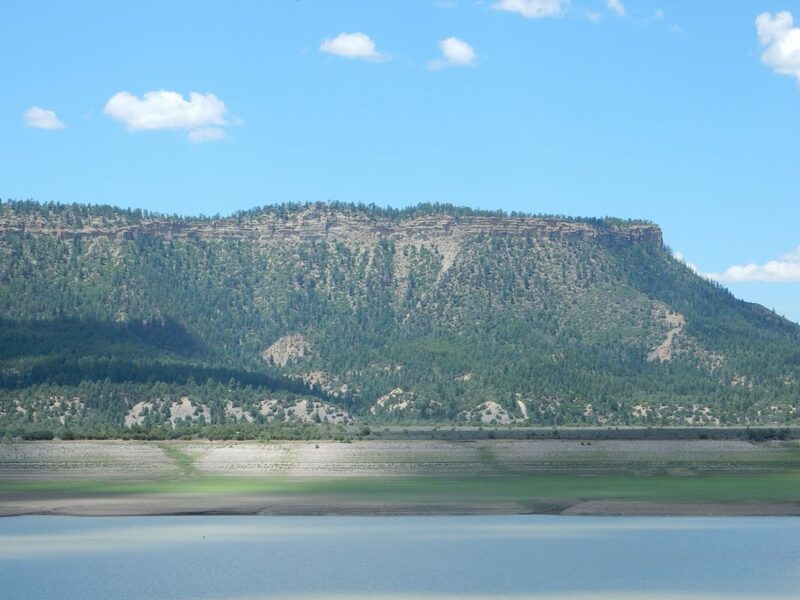 In this case, the beach that deposited the Dakota Formation moved back and forth a couple of times; thus, the deep-water Mancos Shale is present between upper beds of Dakota Formation, as well as above the Dakota Formation. 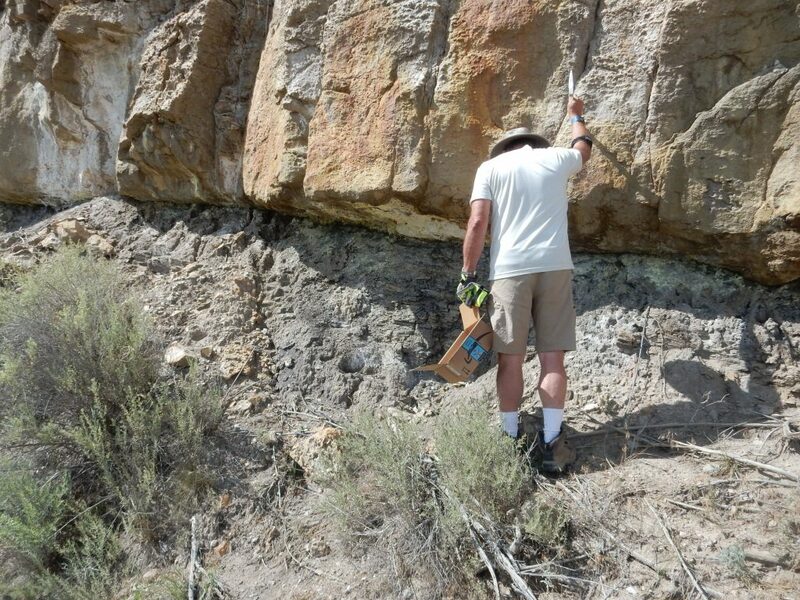 Gary scrutinizes the Clay Mesa Member for traces of fossils. 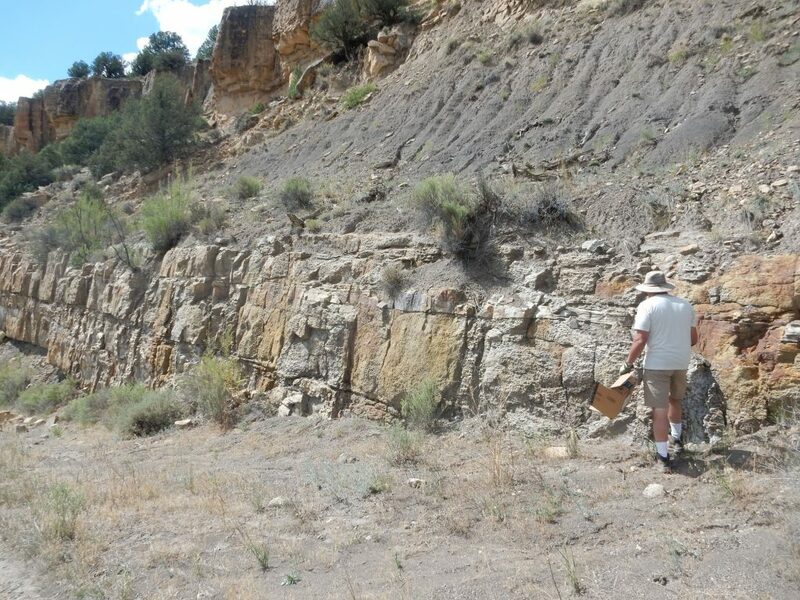 Our best home for ammonites is limestone beds within the Mancos Shale. And, I’m only guessing at locations now. The steep canyon walls are throwing off my GPS lock by about a hundred yards, significant in this area of rapidly changing geology. Gary notices cliff swallows under the Paguate Member. Or their nests, anyway. I didn’t actually spot any birds. I do spot what looks like a patch of river gravel. 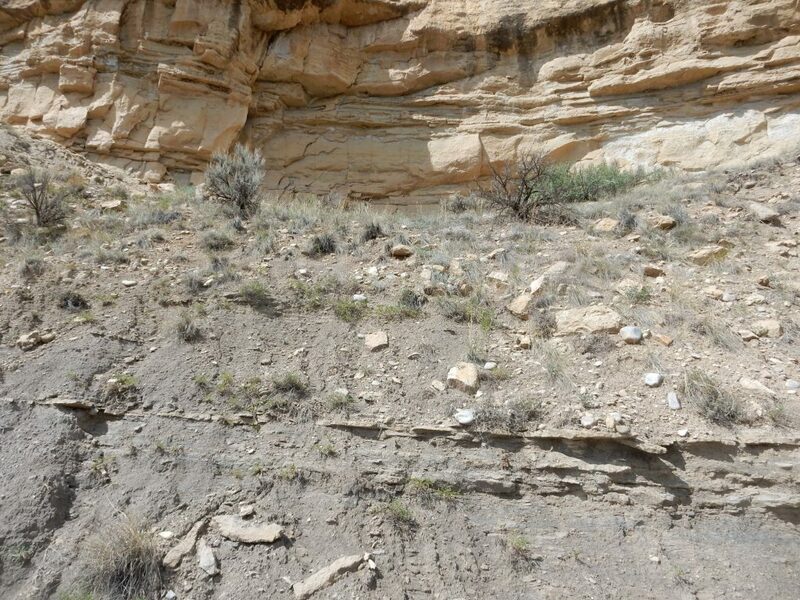 This could be either colluvium, terrace gravel washed over the canyon rim above, or a river terrace from when the Rio Chama had cut down to this level. Beneath the Clay Mesa Member, we’re back to the Dakota Formation, which in this case is the Cubero Member. My road log confirms the bioturbation I thought I saw in the Paguate Member; but the Cubero Member is spectacularly bioturbated here. In fact, the beds are a mass of tunnels. I’m impressed. Fortunately, so is Gary; I was starting to feel bad about not reconnoitering his northern hunting area with him, and taking him on what is looking like a wild ammonite chase instead. But I think the bioturbation is making the trip worth our while. We both grab big yard rocks; here’s mine. So what dug these tunnels? Since the actual organisms were apparently not fossilized here, we can only guess, but the usual guess is crustaceans, or possibly worms. The contact of Cubero Member with the underlying Oak Canyon Member is very sharp. The efflorescence on the rock interests Gary. I guess that it’s lime, with some yellowish coloring from iron. Gary swears he can smell sulfur, and when he hammers on a sample later, I can smell it as well. That suggests some hydrothermal activity in this canyon sometime in the past, not impossible given the local tectonics. Another sandstone bed. 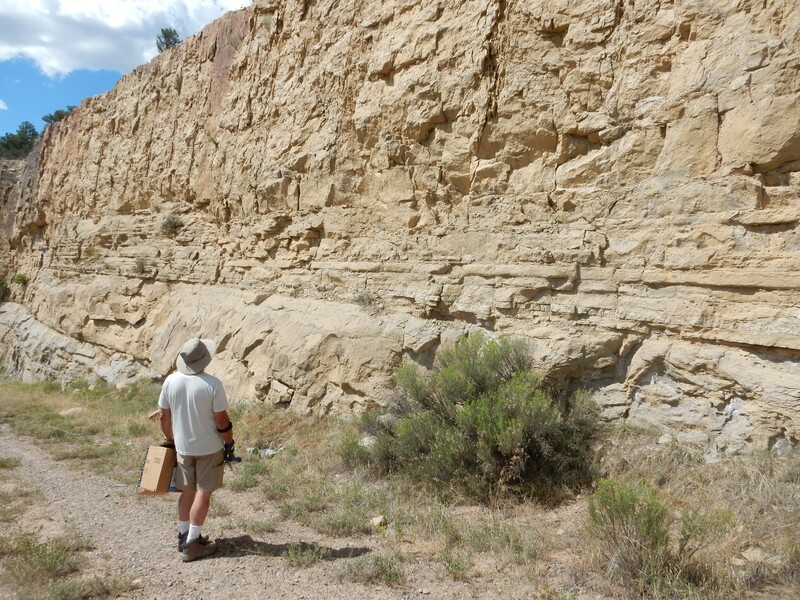 This is likely the Encinal Canyon Member of the Dakota Sandstone. And below that, the Burro Canyon Formation. The Burro Canyon Formation is a Cretaceous formation found below the Dakota Formation in some places. 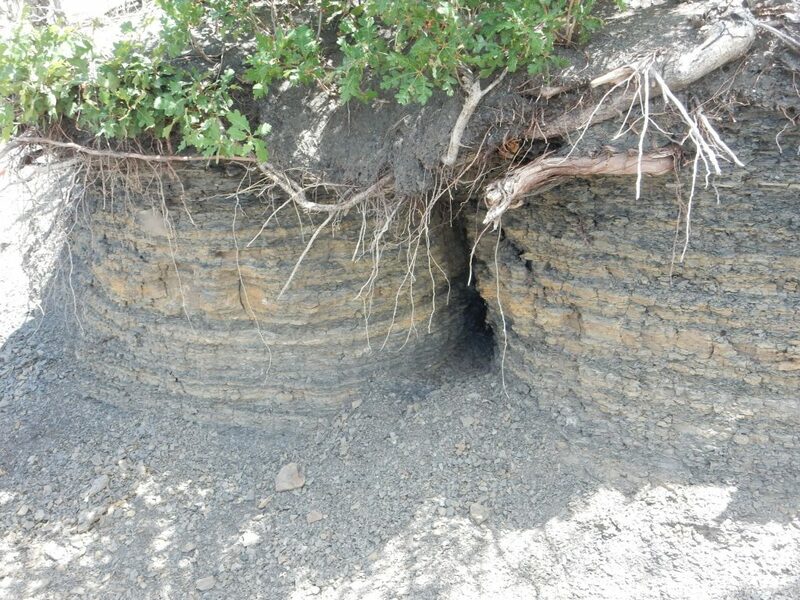 It’s interpreted as delta deposits around the shore of the Western Interior Seaway when it first invaded the continent. If I squint just right at the stratigraphic section in the road log I’m using, I can match these beds up and conclude that almost all of this is Burro Canyon Formation, and the contact with the Encinal Canyon Member of the Dakota Formation is the dark layer near the top of the cliff. 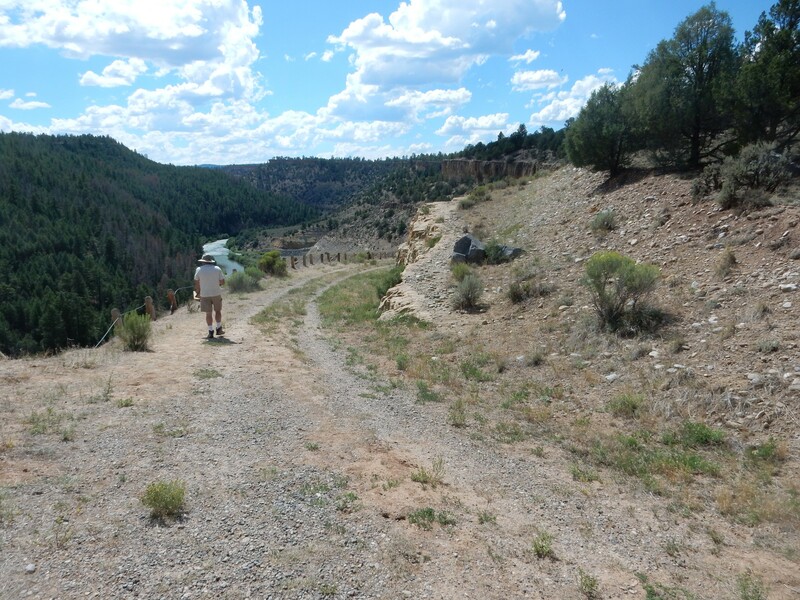 We climb back up the road with our samples, pausing to get some yard rocks of bioturbated sandstone. Near the top Gary comments on the jointing in the Paguate Member and I take a picture. The vertical joints do seem rather regular. 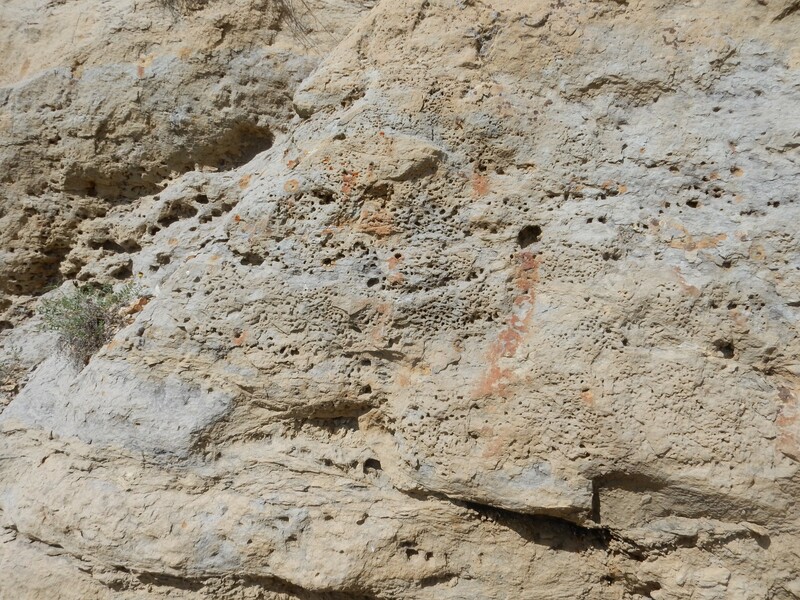 They don’t look like blasting marks, of which we see some clear examples elsewhere; they look like natural jointing in the stone. Go figure. We pause near the park headquarters, where I vaguely recall fossils being mentioned. We find a few. Possibly Inoceramus, the ubiquitous Cretaceous oyster-like mollusc. There are a few fossils. There is also a young family camping here. The father introduces his children; they have city names. Gary, with a straight face, introduces himself as Houston, then explains the joke. He is better with people than I am; he manages to not be offensive. The son is quite interested in fossils, of which his father has already found one. Nah. It’s an okay shot, but not a great shot. Red Entrada Formation overlain by lighter Todilto Formation. Sometimes — fairly often, actually — I have a good idea that a shot is going to be good when I take it. Sometimes I hope it will be good, and I’m disappointed. And now and then I’m not much thinking about it when I take the shot, but when I get home, I realize it’s a great shot. There is a thunderstorm ahead as we leave Abiquiu. Lots of ground strokes of lightning. Alas, nothing in White Rock when we get home. Tomorrow I leave for Utah. Hoping I get some great shots on that trip. Great field report Kent. I had a great time. Thanks!